Pius IX, together with the First Vatican Council, infallibly defined that "Peter alone was honored with the true and proper primacy of jurisdiction, to the exclusion of the other Apostles, be they considered individually or as a group" (De Ecclesia Christi of June 18, 1870, DR 1822). Many progressivist theologians oppose this doctrine and defend that the very essence of the Papacy is collegial, that is, not coming from only one man as the successor of Peter, but rather from the College of Bishops as a successor of the College of Apostles. Among these theologians, Fr. Yves Congar was one of the most significant. He was one of those responsible for introducing this erroneous doctrine into the documents of Vatican II. Although he never renounced this wrong thinking, John Paul II elevated him to Cardinal in 1994. Here we offer an excerpt in which he clearly opposes the infallible doctrine of the Primacy of Peter and affirms the wrong doctrine of collegiality. In passing he expresses scorn for the Pope as Vicar of Christ. 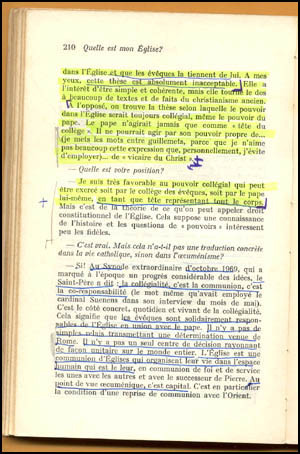 Top right is a facsimile of the book cover; at right, a photocopy of the French text. Below, we present our translation. "Some say that only the Pope has universal jurisdiction in the Church, and that the jurisdiction of the Bishops proceeds from him. In my opinion, this thesis is absolutely unnacceptable. It has the advantage of being simple and coherent, but it turns its back on many texts and facts of early Christianity. "I am strongly favorable to a collegial power that can be exercised by the College of Bishops as well as by the Pope himself as its head, representing the whole body." 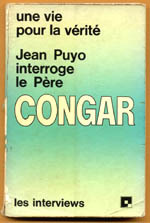 (Yves Congar, Jean Puyo Interroge le Pere Congar, Paris: Centurion, 1975, pp. 209-210).